We've been exploring tangling within grids and we think the results are worth sharing. We invite you to enjoy your own exploration of this idea. In grid-based tangles, you may have noticed that all you need is one square, just one. Then whatever stroke is placed in one square resonates throughout your grid. 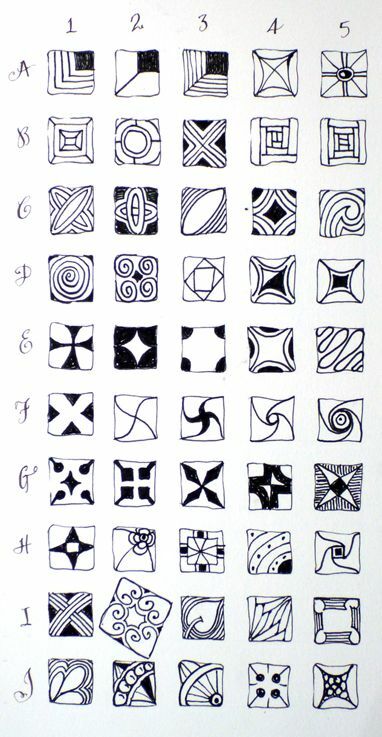 Perhaps you draw one stroke in each square, then the next stroke in each square; or maybe you tangle all one square then move on to the next. Either way, inspiration abounds. Such a dance . . . simple and elegant! This approach combines tripoli and grids. Tripoli was introduced in this newsletter. In tripoli, we group adjacent triangular shapes, then we fill each one in the same way. The more symmetrical the fill, the more those triangle groupings reveal additional patterns. We use a similar approach in grid unlocking (similar to how adjacent paradox tangles are organized; or, how squares are laid out in quilts). It is so much fun to create a simple grid element and then see what the overall tile looks like when they are "drawn together." Here are a few samples we created . . . In the above tile, Maria used I-2 and tangled the first stroke throughout the whole grid, then the second stroke, etc. In the above tile, Rick used F-4 and its mirror image. He tangled the circles throughout the grid, then added the spirals, grid seed by grid seed. In the above Zendala, Maria used J-1. She did each stroke throughout the entire grid before adding the next stroke. In the above tile, Rick used I-1. He first completed all the lines in each grid square before moving on to the next. When they were complete, he went back and colored in the triangles, which had now become diamonds. To give a sense of rounding, the outer grid squares are half width but they are drawn in exactly the same way as the center square ones. In the above tile, Maria uses a hybrid of grid seed B-5. She tangled each grid square completely before moving on to the next one. So, try some of these, create your own, and enjoy where this latticing journey takes you! I'm learning Morse Code. Now when I tangle, I leave a recording of it playing in the background. I don't try to translate the code, I just focus on my tangling. I was inspired to do this after reading Zen and the Art of Radiotelegraphy by Carlo Consoli (translated into English from Italian). He suggests that by letting code play while you do other activities (and NOT trying to decode it) it will "sediment" into your mind. So far, this seems to be a great benefit to my learning. I imagine there can be a similar benefit if you are learning another language. So, if you are learning another language, try playing that language in the background as you tangle. Don't try to translate it, just focus on tangling. And let us know how it works! 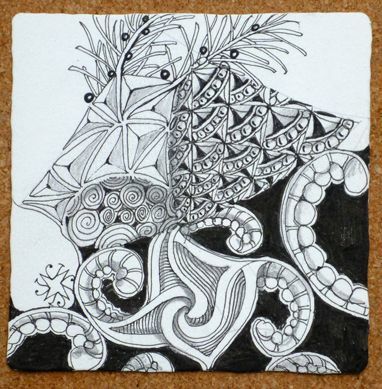 I lent my Zentangle kit to my daughter who is a primary school teacher in Australia. She soon had all the children Zentangling. They produced the most wonderful works of art. She has mounted them and strung them around her classroom. It especially helped the children that had problems to concentrate and focus. For the first time these children found something that held their attention and the class was "quiet". One little boy even went home and produced two pages of beautiful Zentangle art and he is one of those children that has major learning difficulties. The public schools here have an integrated system with the children that have aspergers and other problems joining the main stream class. It is not always easy to help these children get through the day. I want to thank you for producing a product that has such amazing results in children that are sometimes forgotten and find life so very difficult. I just love your website. I really appreciate your talent for design. I have purchased your coffee table book and think it is amazing. I have read it cover to cover. I am a watercolour artist so appreciate all the detail in your paintings. Your book really is an inspiration. 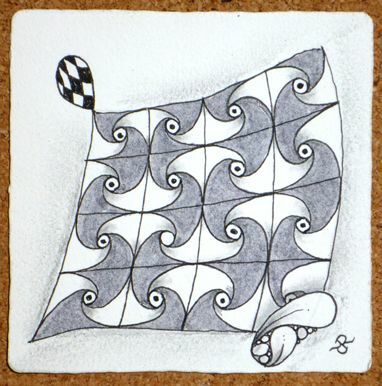 I have been in contact with Michele Beauchamp, CZT* in Tasmania and she has been so helpful as I am new to Zentangle. She has been such a fantastic contact. I have ordered the Apprentice Kit for my daughter to use in the classroom and another original kit for my sister. 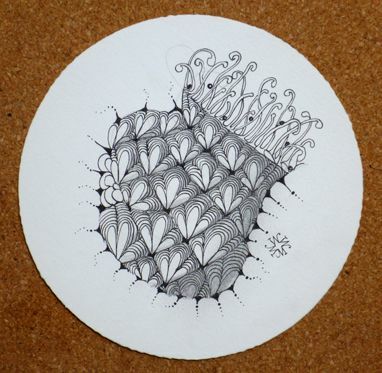 Michele is a fantastic Zentangle artist. I love her patterns. The service I received from her has been so good. She is a special person. 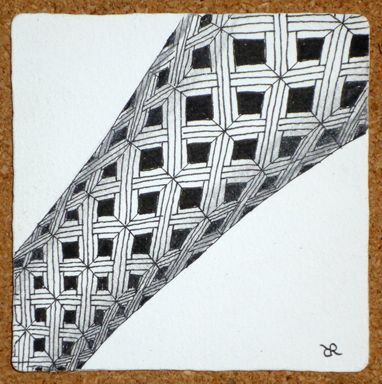 Zentangle seem to help so many people for different reasons and for me it is another artistic string to my bow! I have always really loved patterning. I have purchased a couple of the books by Ernst Haeckel, you have recommended in the back of your coffee table book and they are another source of inspiration for me. 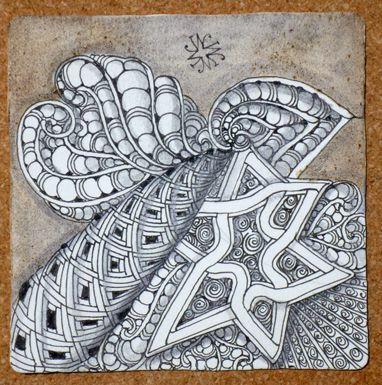 * Certified Zentangle Teacher - See our CZT list. You are invited to a gallery opening and artists' reception at the gallery at Alternatives in Whitinsville, Massachusetts. 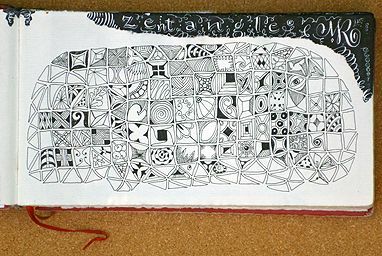 Most of the original artwork for The Book of Zentangle will be framed and on display. We will be there from 5 - 8 PM, on Friday, June 7, signing books and meeting everyone. Signed prints of some of our artwork will also be available. We look forward to meeting you and showing you how the left side of our book was created. Take a moment to check recent posts on our blog, particularly this one about more tangled French Ivory! We look forward to meeting you at our gallery reception. Enjoy your exploration of tangling grids!